I'm not sure what I did on weekdays at 9pm during my earliest years but after 2000 the answer was simple. I was watching The Simpsons on The Comedy Network. Most of my middle school friends were doing the same and this put us in a position to witness the end of an era. Reruns that aired every day seemed strikingly different from the new episodes that aired on Sunday and it did not take us long to figure out that the latter were steadily getting worse. The decline of The Simpsons is common knowledge but I recently found a visualization which puts it in a rather harsh perspective. This chart, by filmmaker Sol Harris, points out among other things that The Simpsons has more than twice as many episodes as the next longest running cartoon. The writers would be able to take 14 years off to come up with good ideas again and still be able to call themselves the record holders. I would say the tail is so long that some viewers, who have already been watching for a number of years, were born after the last good episode. But what is the last good episode? Modulo some broken clocks that are right twice a day, Harris tells us that it is the 12th Halloween special which aired at the beginning of season 13. The episode afterwards called "The Parent Rap" is scorned as "the definitive moment when the show went from 'Bad Simpsons' to 'Bad Television'". In the Harris ratings, which I have re-plotted above, the beginning of season 13 indeed looks like a turning point. A more satisfying exercise is to justify this with maximum likelihood estimation. This idea comes from a guy named Nathan Cunningham whose blog has some nice statistical gems. In Cunningham's analysis, he uses ratings from IMDB to find the optimal partitioning into good and bad episodes. I think there are good reasons for repeating this with Harris' data set. First, changes to IMDB have broken the R code for scraping the site. Second, the detailed chart that Harris posted on Twitter was criticized for its low resolution. Transcribing it into a machine readable format in order to help those users is something I wanted to do anyway. And third, Sol Harris has expertise in this area. Presenting his opinions as the gospel shows a better understanding of humour than any humble warning about their subjectivity ever could. And so I present, the spreadsheet of the ratings. The first row should explain the format. Evidently, Sol Harris gave the first episode a rating of 7/10. A 0 in the superlatives column means that this was neither the best nor the worst episode of the season. These episodes are marked with 1 and -1 respectively. To get this data, I looked at the 2048x280 version of the chart and manually recorded each position hit by the line. 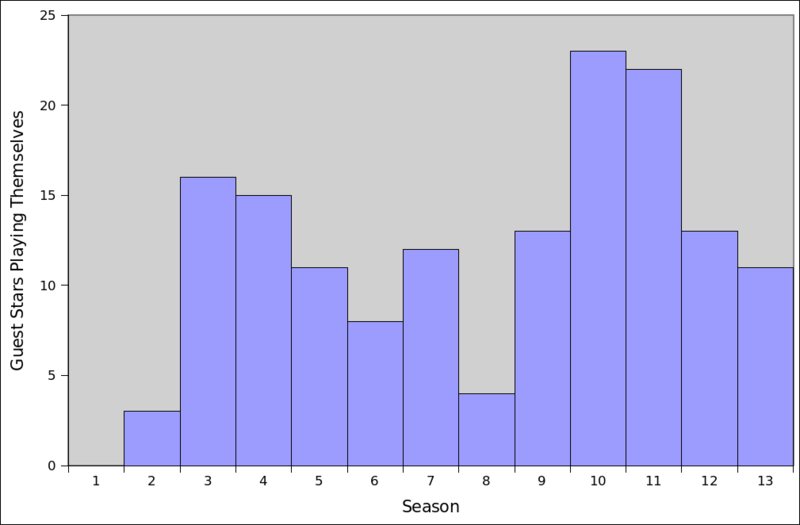 Streaks with many consecutive episodes of the same rating were a little hard to discern. Nevertheless, one can use the fact that each episode takes up about 3 pixels of horizontal space. Coupled with the occasional checkpoints, marking the best / worst episodes and season boundaries, the ratings can be written down in all rows from 1 to 618. Doing this took some time but nowhere near the amount of time Sol Harris must have spent by suffering through hundreds of barely watchable episodes. It is now time to reveal the results from Cunningham's code. I would say this is very much in line with my opinion — if I were to do a Simpsons binge watch, it would end somewhere in season 13. In discussions about where to draw the line, there are a few schools of thought. This is partly due to personal preference and partly because of the ambiguity in what exactly is being asked. Having the decline first become noticeable is different from the final nail in the coffin. Season 9's "The Principal and the Pauper" is one of the most frequently criticized episodes, and for good reason. It tries to sell audiences on the idea that Seymour Skinner, one of the main characters outside the titular family, has been secretly committing identity theft for the last nine years. Cast member Harry Shearer, who voices Skinner, pointed out that this was a lazy story that would do nothing but alienate the audience. Despite the obvious mistake that "The Principal and the Pauper" was, I think it's worth holding out until the brilliant "Trilogy of Error" in season 12. The vast Dead Homer Society website admits that this episode is an exception even when it condemns the double-digit seasons in general. Something else that I found within its miniature book is a plot of how often Homer takes on a throwaway new job. There is indeed a sharp peak in season 10. I found a similar peak when counting the number of guest stars playing themselves. The rules for this are to combine members of performing groups and to specify that someone who appears two or more times in the same season is not counted again until the next season. While doing background reading for this post, I found out that Julian Assange is actually one of these people who played himself in 2012. And while writing this post, I found out that he was just denied asylum at the behest of Donald Trump and other enemies of a free press. I guess this answers the question of which will end first: The Simpsons or the stalemate surrounding the only political prisoner in Europe. These times call for reason, compassion and satire — the most effective medium for challenging authority. The necessary inspiration can come from all sorts of places and The Simpsons is high on my list... just make damn sure you stop watching after The Golden Years!